What does end user adoption look like? To me, end user adoption is when a company is using an implemented solution years later; furthermore, the solution has evolved to meet the ever-changing needs of the company. Why is end user adoption important? Believe it or not, many customers invest in a solution and never use it. End user adoption maximizes your company’s return on investment. How can your company achieve end user adoption? Do not implement a half-baked solution. Everyone wants a fully automated solution until they see the sticker price. I do not advise implementing a fully automated solution because business needs will change, but invest in a solution that is seamless enough so that someone new can jump right in. The biggest risk to end user adoption is an organization not being engaged in the implementation of a solution. Anaplan is a tool, not a cure-all. Your company chose Anaplan because it has pain points it is trying to solve. Maybe it is enabling more efficient processes that will give employees their nights and weekends back. Whatever the reasons, stay engaged by focusing on the end goal. If you use Excel in your everyday job, expect to use Anaplan just as much. It is easy to get caught up in your day-to-day job tasks. Make it a goal to dedicate 15 minutes a day to something Anaplan related. You will soon discover that 15 minutes can easily turn into an hour. Before you know it, you will be comfortable with Anaplan. 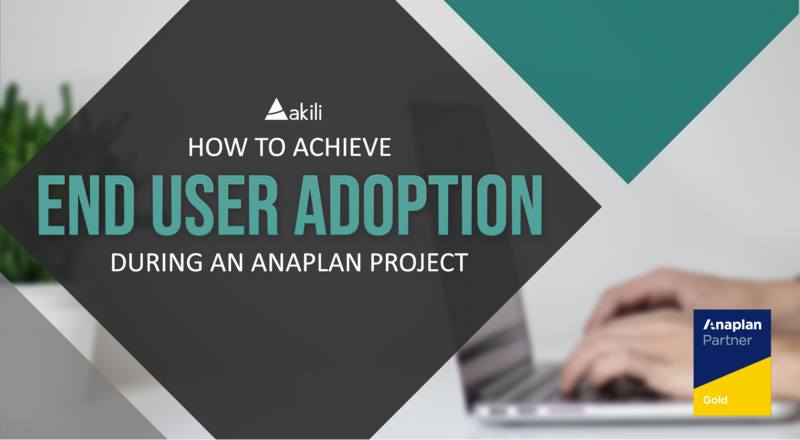 Your initial set of users know Anaplan, but what about the people after them? Create an internal Center Of Excellence (COE) team to maintain, support, and enhance Anaplan. This team will be accountable for creating standard work documentation, training videos, and hosting training workshops. Companies choose Anaplan because it is flexible. Why? Because as your business evolves, Anaplan can evolve with it. Be aware and comfortable with the fact that Anaplan won’t look the same two years from now. End user adoption will never be “complete”. It is an iterative process that requires an investment of time and a high level of accountability from you and your organization to ensure its success.